Family-owned and operated Highlight Homes, LLC and Highlight Home Restoration would like to take this opportunity to wish you and your family a Happy Holiday Season and All the Best for 2010. We realize that 2009 was a difficult year for so many in Georgia, and we look forward to a steady improvement in both the job and housing markets in the coming months. This has been a year of many changes for our company – the greatest of which being the launch of our new website and the debut of our renovation division, Highlight Home Restoration. We feel blessed to have met so many incredible families – many of whom have become our wonderful new clients. We are thankful to each and every one of them for choosing Highlight Homes and Highlight Home Restoration to complete their home improvement project. Highlight Homes’ Principal, Tony Pourhassan and the rest of the HLH family look forward to meeting and serving an entirely new collection of families in the coming year. In the event that YOU are considering a home renovation project in 2010, we invite you to call on us at 678.873.9234 or fill out our online contact form at www.highlighthomesga.com. We are accustomed to working on projects of varying scopes and sizes, and can happily design a “living space” to fit both your vision AND your budget. We would love to have the opportunity to help make your New Year HAPPY! May your 2010 be filled with MANY highlights!!!! “Your Family is the Highlight of Your Life. Have you ever heard the expression “You get what you pay for”? The reason that particular phrase has had such staying power is that it is very often true. Have you ever bought something or hired someone simply because of the price? Chances are – if you have – you’ve learned your lesson. Don’t feel bad – we’ve all done it! The unfortunate truth about price-shopping is that you may appear to be getting a very good deal from the start, but when the item in question breaks, stops working or falls apart long before the so-called warranty runs out – you may have a difficult time getting it repaired and might just have to start at square one. When you try to return it or contact someone at the original company to help with the problem, there often seems to be a reason they cannot help you (without charging you an additional fee.) The same holds true for home construction and renovations. As experts in the construction field, the folks at Highlight Homes and Highlight Home Restoration are well aware that there are unscrupulous individuals and companies in our industry who are willing to cut prices just to get the job – but what does that really mean for you, the customer? Sometimes the customer lucks out and their project goes off without a hitch, but more often than not – their project ends up being nowhere near their original vision or is merely a disaster waiting to happen. Builder, developer and architect, Anthony F. Pourhassan, established Highlight Homes, LLC in 2005. The Atlanta-based company is founded on the core belief in the significance of what we are creating, firmly based in our lasting dedication to the clients we serve, and continually growing as word spreads of our unswerving commitment to quality. Because Highlight Homes, LLC is family-owned and operated – we truly care about our clients and their families. We listen carefully to our clients’ wants and needs, then design and implement plans to fit both their vision and their budget. As a luxury builder and renovator, Highlight Homes takes great care in assembling our team of professionals – there’s no room for shoddy craftsmanship when dedicated to providing the very best quality to our customers. Each Highlight Home contractor is fully licensed and registered, and is well prepared to tackle projects of varying size and scope – from a luxury custom estate in one of Atlanta’s trendiest neighborhoods to a cozy, bungalow-inspired home in the sprawling suburbs. Our NEW division – Highlight Home Restoration – specializes in basement finishing, room additions, kitchen & bath renovations, outdoor living spaces, decks & patios, sunrooms, landscaping & ponds, architectural design services, whole home restorations and much more. All restorations adhere to the same strict guidelines, structural integrity, and environmentally friendly practices of a Highlight Home. Home additions are carefully designed to reduce energy consumption and material waste, and all construction debris is disposed of through recycling. At Highlight Homes, LLC/Highlight Home Restoration – there are several very good reasons we price things the way we do. No matter the state of the nation’s economy, we will never compromise the high standards on which our company was founded. Highlight Homes uses only quality materials and the most talented, insured contractors we can find. We are always readily accessible to discuss the overall vision of any project and to address any issues that our customers might have. While we truly love the work we do, we cannot survive on love alone. We are in business to stay in business and to continue to promote only the finest quality craftsmanship in every home and project we complete. Like you, we have bills to pay and families to feed – we never “price gouge”, but merely quote a project based on the work and materials a project demands. If you are concerned with quality over price, you will find Highlight Homes/Highlight Home Restoration to be worth every penny! To begin construction on your one-of-a-kind custom home or transform a room of your home into a “living space” where your family can make memories together for years to come, contact Highlight Homes/Highlight Home Restoration today at (678) 873-9234 or via e-mail at info@highlighthomesga.com. 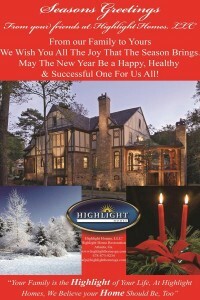 To learn more about Highlight Homes and all of our services, visit our NEW website at www.highlighthomesga.com. Highlight Home Restoration is in the News! The Highlight Home Restoration project selected for the December 2009 issue of Atlanta Home Improvement Magazine was a combination kitchen-living room-dining room renovation. Joe and Renee Guerrisi began the journey to renovate their home with Highlight Home Restorations in late 2008. The couple had been working with another builder for nearly a year, but were never able to see eye-to-eye on a project to fit their budget or a design to fit their vision. They wished to update the interior of their 1950â€™s ranch home by creating stylish, open, and intelligent living spaces. They hoped to incorporate the latest appliances, decorative accents and all wood cabinetry – particularly in the kitchen, dining room and living room. Thanks to a referral from a local realtor â€“ architect and owner of Highlight Home Restorations, Tony Pourhassan redesigned the project to take the Guerrisi’s vision to entirely new heights. His original design called for the addition of two wings to the home and the conversion of their current carport to a three-car garage. Unfortunately, there were a few obstacles to overcome along the way. The Guerrisi’s were on another journey, as well. Their career took them abroad to live in Singapore the majority of the year – only to return to the States for a few days every other month. This made it necessary for many design/materials approvals and communications to be made via internet. In addition, due to the timing of the project in relation to the volatility of the banking and housing industries – the couple hit a roadblock in securing a loan for an addition to their existing home. This led the designer-builder and homeowners back to the drawing board to find innovative ways to maximize the space they already had. Once the new design was approved, time was of the essence. The couple was moving back to the United States permanently, and wished to have their home complete in time for their arrival. Highlight Home Restoration now had less than two months to gut, rewire, install new plumbing, reconfigure HVAC, and completely alter certain structural components of the home. Atlanta Home Improvement Magazine is available all over the Metro Atlanta area. To find the location of an Atlanta Home Improvement Magazine rack nearest you, visit their website at www.homeimprovementmag.com. To learn more about Highlight Home Restoration or schedule your own exciting renovation project, visit us online at www.highlighthomega.com, contact us by phone at 678.873-9234 or send us an e-mail to info@highlighthomesga.com. With the holidays approaching, you may have it in mind to dress up your home for the holidays beyond the annual ritual of stringing lights and hanging garlands. Perhaps you’ve been inspired by an exciting home improvement show and want to tackle a renovation project yourself. However, measuring one’s enthusiasm against one’s skills set can be a difficult task. While it’s important to believe in oneself and one’s abilities, it’s equally important not to “bite off more than you can chew”. If considering a do-it-yourself (DIY) project in an effort to save money, keep in mind that many a well-intentioned weekend warrior has ended up having to pay a professional to fix their mistakes AND complete the project for them. Highlight Homes/Highlight Home Restoration can help you with just about any size and scope of home renovation project including: Whole Home Renovations; Room Additions; Architectural and Design Services; Kitchen & Bath Remodeling; Landscaping & Ponds; Decks, Patios & Porches; Sunrooms; Basement Finishing; Roofing; Home Maintenance and Repair; and Much, Much More! A good contractor will know all the permits required to begin construction on your project. Do you? It might be a good idea to bring in a designer or architect to lay the groundwork for you, tell you about the permits you will need, warn against any possible wiring/pipes you may encounter, and give you a good idea as to the cost of materials. A professional will be able to get materials at a contractor’s rate, where you – most likely – will not. In addition, they will often be able to complete the project much faster – so if you’re hoping to save time and money, you may be unpleasantly surprised. A professional fully understands the importance of using quality materials. Quality materials are essential to the continued success and longevity of any given project. One common mistake made by DIY’s is in thinking that by buying the cheapest products, it will help reduce project costs. In the long run, they can actually end up costing more. Unfortunately, cheaper often means inferior. There is truth in the statement “you get what you paid for”. It is vital to know how products effect the environment, your property and – most importantly – your family’s health. A professional contractor will remain up-to-date and understand how to meet the terms of ever-changing environmental compliance issues currently facing the construction industry. Buyer Beware! If you decide to take the lead on your project with the aid of a number of inexpensive subcontractors following behind, be very careful. Professional builders and contractors have already gone through the trials and tribulations of how to identify reliable sub contractors. Many professionals have taken the time and expense of putting their subcontractors through rigorous background checks, allowing them to cull through any unscrupulous & unreliable candidates before the job even begins. A good contractor will be fully licensed, registered and insured â€“ in the event that they are injured or a portion of your home is damaged somehow, it’s covered. You might want to take a closer look at your home and personal insurance policies to make sure you can say the same. Before you have anyone work on your property, it’s wise to insist that they provide you with General Liability & Workman’s comp insurance certificates – adding you as additionally insured. It’s also a good idea to require that when you make a payment to them that they sign a release of lien rights for that amount of money relating to your home. Consult a professional or structural engineer if you plan to remove any walls, posts, roof framing, concrete or any other supports in your home. It may appear from the outside that any one particular piece isn’t doing much until it is too late, and things can go from a great idea to a great tragedy in an instant. It’s always a good idea to check with a professional on your heating & air systems. The original system was chosen to accommodate your existing space. If you alter the space or add any additional space, the system may need to be reconfigured to adjust to your changes. Electricity and plumbing can make for a dangerous combination – exercise extreme caution while maintaining your enthusiasm for the work. We wish you the best of luck!Â In the event that you find the project is bigger than you anticipated, the Highlight Home Restoration team is here to help you! Call us at 678-873-9234 or visit us online at www.highlighthomesga.com!